WEST Coast Railways revolutionised the West Highland tourist economy with the development of its summer walk-on ‘Jacobite’ steam services. Last year, the Carnforth operator ran the North Norfolk Railway’s trial dining trains to Cromer. 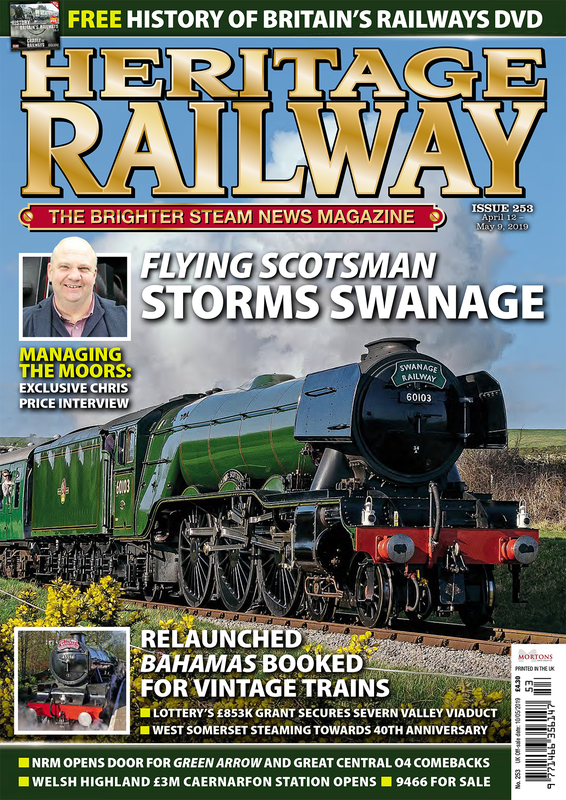 And this year, the firm has now headed to the south coast, to take charge of the Swanage Railway’s grant aid-funded ‘real’ passenger trains over the entire length of the LSWR branch. While steam over the line from Swanage to Wareham in future years is not only an aim but a distinct possibility, the new regular services – the first over the branch in 45 years – are set to be handled by a pair of heritage DMUs currently being refurbished at Eastleigh but meanwhile are waiting for new wheelsets to arrive. However, in the meantime, diesel locomotives will top and tail these services, operated by West Coast, which has been brought in because they will run over the national network between Wareham and Worgret Junction. 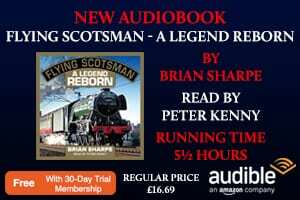 Going back to the Sixties and Seventies, many rail revival groups were founded with the aim of restoring regular services to branch lines axed in the Beeching era. However, only a few select BR lines were either saved or later restored in their entirety – the Keighley & Worth Valley, the Dartmouth Steam Railway and more recently the Ecclesbourne Valley come immediately to mind. While the West Somerset Railway did run carmine-and-cream-livered DMUs for a number of years in a bid to provide ‘real’ as opposed to enthusiast services, most revivalist groups never succeeded in reaching that goal, and settled for a very different animal indeed – the heritage line. The Swanage branch closed – nobody appears to know exactly why – on January 1, 1972. Around 500 passengers made the last return trip on a six-coach train, comprising two 1957-built Hampshire DEMUs. A special ticket had been printed by British Rail, costing 50p for adults and 25p for children. The driver was ‘Johnny’ Walker, from BR’s Bournemouth depot. He had also driven the last timetabled steam train out of Swanage in September 1966. Afterwards the section as far as Furzebrook sidings was retained for clay traffic, while the rest of the track, the 6½ miles to Swanage, was ripped up. 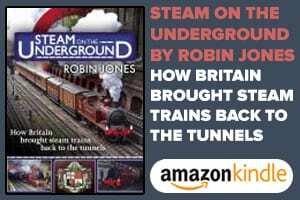 To cut a very long story short, it has taken the volunteers who relaid the missing track to the point where their railway could accept incoming charters and stock movements until now to see the full fruits of their labours. 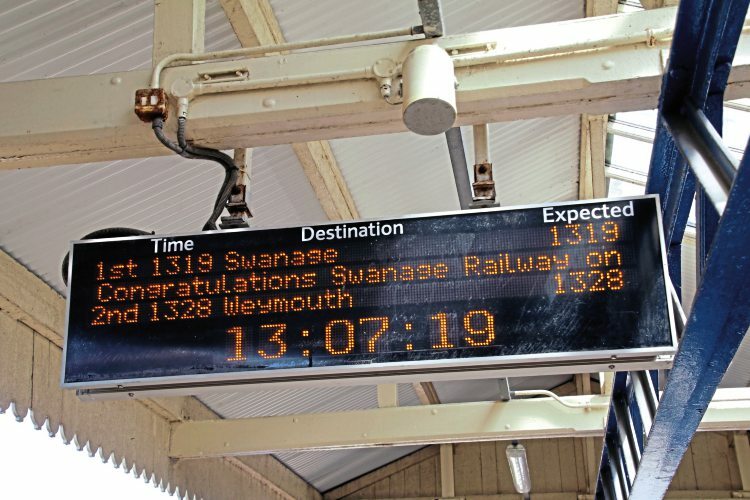 Heritage-era history was made on June 13, when the first through train departed from Swanage at 10.23am. Home-based Class 33 D6515 was on the Wareham end of the four-coach train while West Coast’s Class 37 No. 37518 was on the Swanage end. The rake of coaches comprised three Mk.1 Trailer Second Opens and a Mk.2 Brake Second Open. Sending off the first train, Purbeck Community Rail Partnership chairman, Coun Bill Trite, himself a pivotal figure in the rebuilding of the branch, blew a brass horn first used in May, 1885, to dispatch the first train from Swanage – 132 years before – after the 10-mile Victorian branch was opened. 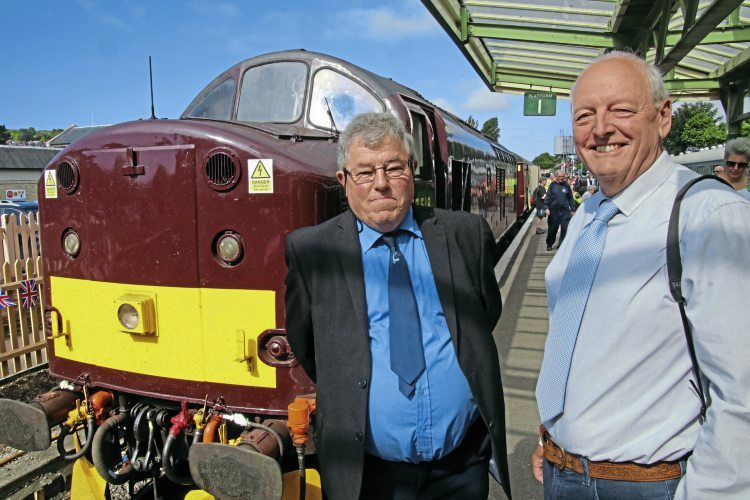 Other Swanage Railway pioneers, volunteers and staff who worked across two generations to rebuild and reconnect the heritage line had the honour of travelling on the first passenger service train. Early Swanage Railway volunteer, Julian Hathaway, flew in from his home in Scotland to ride on the first train. 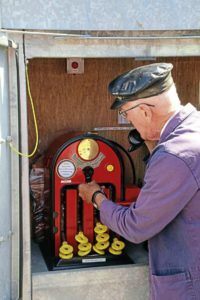 In 1979, he helped to drive the first passenger train at Swanage, an industrial diesel shunter and a carriage, over a few hundred yards of hand-laid track. A volunteer signalman for 25 years, Malcolm Munro travelled on the last BR train from Swanage to Wareham as a 16-year-old. Describing the relaunch of through public services, Malcolm said: “It was a wonderful day I will never forget and one I had waited so long to be a part of. There was a great feeling of belonging to something really special. “It was like a great family celebration but I was mindful of those people who played a part in reaching this moment who are sadly no longer with us to take part. Another passenger on that first train was Bob Richards, who was the British Rail signalman at Corfe Castle who signalled the last train between Swanage and Wareham. Growing up in Corfe Castle, Peter Frost knew the branch line well as a child and rode on the last train in 1972. Four years later, as a 17-year-old, he was one of the first group of Swanage Railway volunteers that begun restoration work at Swanage. 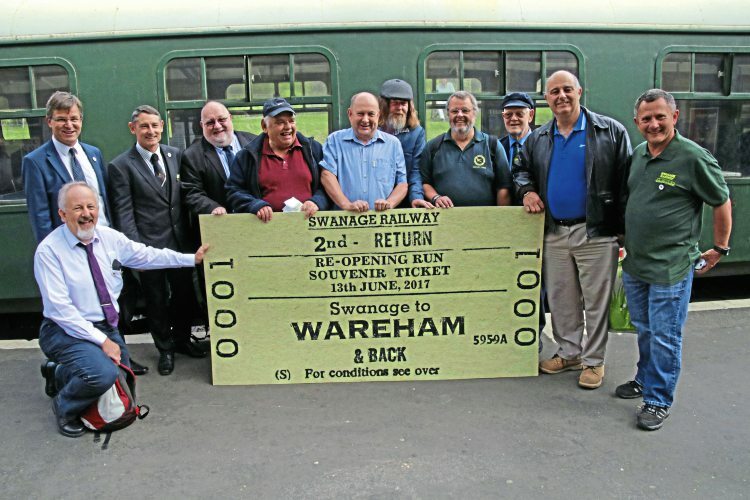 Neil Tatchell, a teenager when he started as a Swanage Railway volunteer in 1976, said: “Riding on the first train to Wareham in 45 years is one of the happiest days of my life. We all looked very much older but we were all very proud of our collective success. 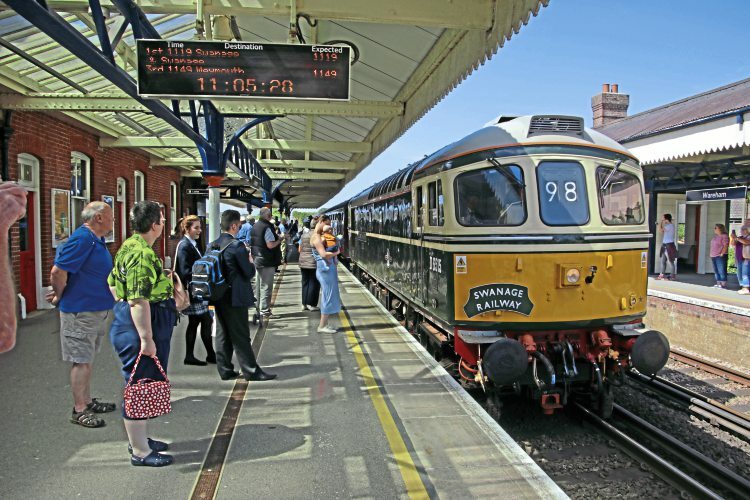 A dedicated volunteer since a teenager in the 1980s and now the director of the Swanage Railway’s Project Wareham, Mark Woolley, said: “Returning trains to Wareham shows that great things can be achieved through community action, dedication, hard work, teamwork and partnership. Barry Thirlwall, who also travelled on the last British Rail trains between Swanage and Wareham, said: “It was a wonderful experience and almost surreal. 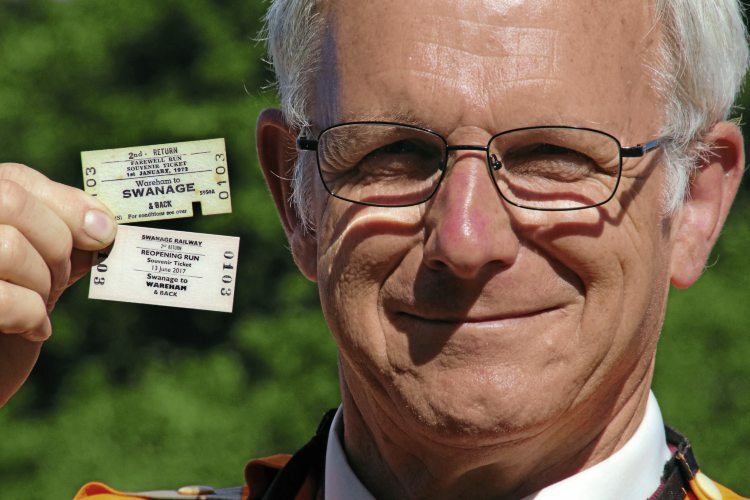 I took my 1972 ticket with me which is now paired with my Swanage Railway Wareham souvenir ticket. 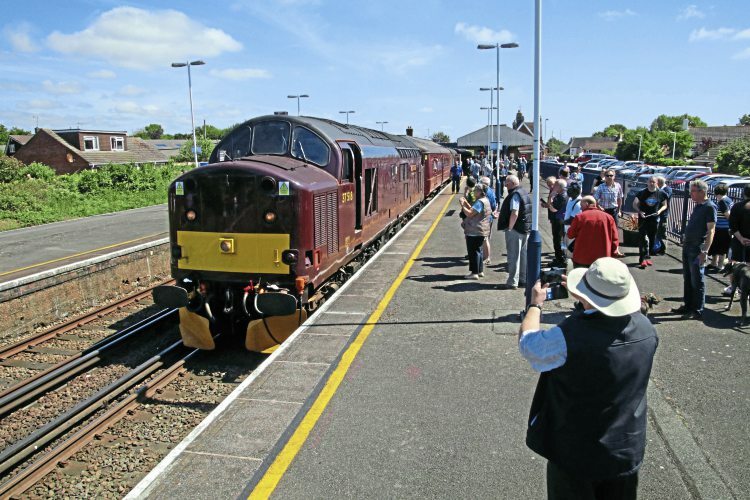 The achievement of returning trains from Swanage to Wareham has been the result of the heritage line working in partnership with the Coastal Communities Fund, Purbeck district and Dorset county councils, BP, Perenco, Network Rail and South West Trains. It had been 38 years since the first heritage trails ran at Swanage. Diesel-hauled trains started running over a few hundred yards of track at Swanage in August, 1979, with steam trains following at Easter, 1980. Passenger trains were extended past the one-mile point at Herston Halt in 1984 and then to the 1½-mile point at New Barn in 1987. 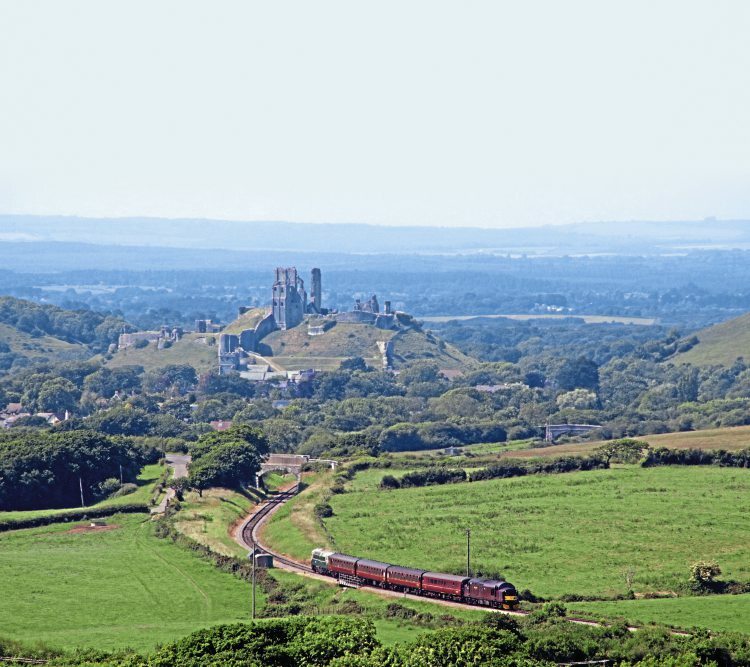 In 1989, the line stretched three miles to Harman’s Cross, and in 1995 it reached the five-mile point to Corfe Castle and half a mile on to Norden. The heritage line met the national railway system at Motala – then the end of the freight line from Worgret Junction – in January 2002. A signalled junction with the national railway network at Motala was installed in 2006. 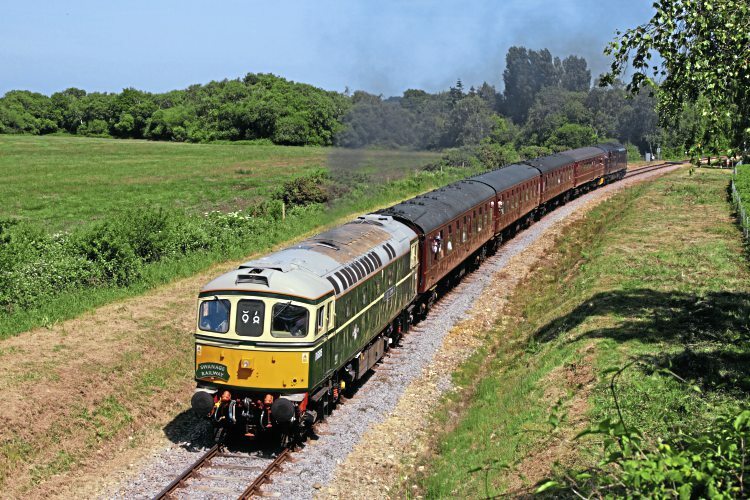 The first diesel train from London to Swanage since 1972 ran in April 2009 – and the first steam train since 1967 came in from the main line the following month. A new signalling system between Swanage Railway and Network Rail was commissioned in June 2014. That year, the Swanage Railway leased the three-mile line from Motala to near Worgret Junction from Dorset County Council and work started on upgrading the line. Half a line of continuously welded track was laid, a quarter-mile embankment was upgraded, other embankments and drains were cleared and lineside fencing renewed. A main line standard level crossing was built at Norden Gates, west of Norden station, in August 2015, to protect the Wytch Farm oilfield access road. The three-mile extension upgrade was completed in April last year, with train speeds raised to 25mph. Wareham at last! West Coast Railways’ Class 37 No. 37518 after arriving from Swanage on June 13. 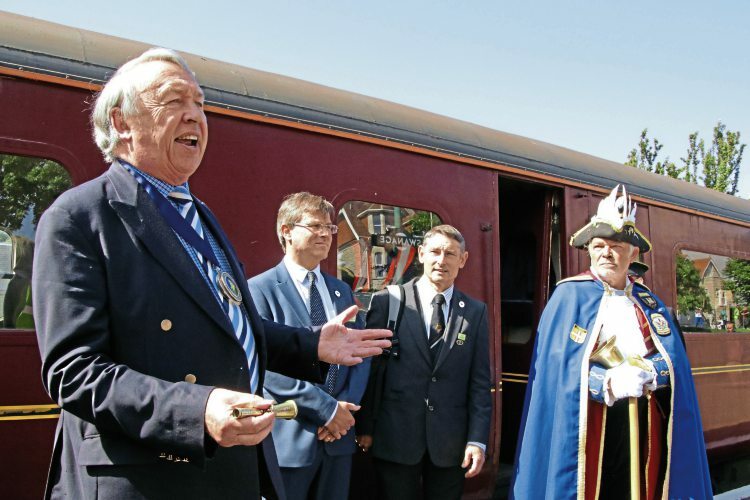 Last June, the £500,000 Norden Gates welcomed its first passenger train, a 12-carriage excursion from the Midlands. The restoration of passenger services involved a £1.8million grant from the Government’s Coastal Communities Fund and an investment of £3.2m by Purbeck and Dorset councils, which came from money collected from housing developers. The first train marked the start of a two-year trial service using diesel trains with four trains a day in each direction each Tuesday, Wednesday, Thursday, Saturday and Sunday until September 3. The trial service will run on a total of 60 selected days this year and 90 selected days during the summer of 2018 with West Coast contracted to operate the service during the first year. Wareham service tickets can be purchased from the Swanage Railway’s website, from a booking office outside Wareham station – when trains are running – from Swanage Railway booking offices at Swanage, Corfe Castle and Norden or by calling the Swanage Railway’s reservations office on 01929 425800. Tickets are £15 for adult or senior citizen day returns between Swanage and Wareham and £9 for adult or senior citizen singles. 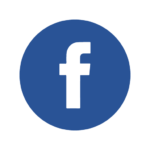 Children, aged 5 to 15, are £10 for a return and £6 for a single. Swanage Railway Purbeck residents’ discount card-holders receive a 33 per cent discount. National Railcards are not accepted. Limited parking at Wareham station – especially on weekdays – means passengers are advised to travel to Wareham by public transport for the train service to Corfe Castle and Swanage on Saturdays, Sundays, Tuesdays, Wednesdays and Thursdays.